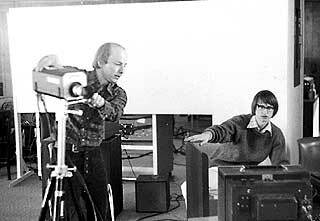 The Experimental Television Center was founded in 1971, an outgrowth of a media access program established by Ralph Hocking at Binghamton University in 1969. Today the Center continues to provide support and services to the media arts community. Visit the timeline below for a chronological view of the Center’s activities over nearly four decades. Student Experiments in Television, a predecessor of ETC, was begun in 1969 by Ralph Hocking on the campus of Binghamton University. SET provided access to the newly developed small format portable video equipment for use by regional arts and community groups and individuals as well as by students and faculty of the University. The technology was applied in a wide variety of projects ranging from social, educational and political programs to arts and cultural events. One series of tapes produced by Angel St. Nunez concerning street life in Bedford Stuyvesant was instrumental in the formation of a Fresh Air Fund for inner city youth. Sections of these tapes were broadcast in 1971 by public broadcasting stations WNET and WGBH. As demand for access increased and with the encouragement of video artist Nam June Paik, the Center formally organized as a not-for-profit educational corporation and moved to a loft space in downtown Binghamton. The Center was among a group of media centers established throughout New York State largely through the efforts of the New York State Council on the Arts and staff Peter Bradley, Russell Connor and Barbara Haspiel. Designed by Ralph Hocking, the Center's programs addressed potential uses of the new technology in three major communities: artists; social, cultural and educational organizations; and interested citizens. Access to equipment, instruction in its operation and viewing and editing facilities as well as a series of regularly scheduled workshops were offered at no charge to facilitate a wide-ranging exploration of video. The applications were as varied as the organizations, and the tapes were frequently screened at meeting places throughout the region. For two years the Center sponsored a weekly community cable show, Access, which programmed tapes produced at the Center. Involvement with artists interested in investigating video as a contemporary art-making medium was an integral part of the Center's activities. A Research Program was initiated to provide a more flexible set of imaging tools to artists. 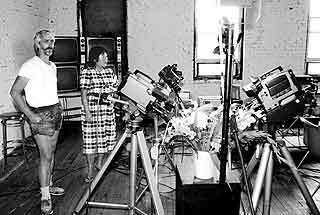 Beginning with modifications to existing equipment, the Center progressed to the design and construction of image processing equipment. 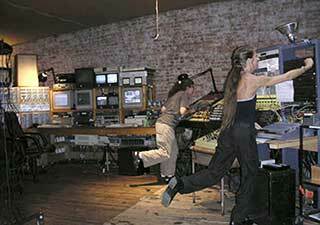 One of the early projects involved the construction of the Paik/Abe Video Synthesizer, under the direction of Nam June Paik and Shuya Abe, for the TV Lab at WNET-TV. 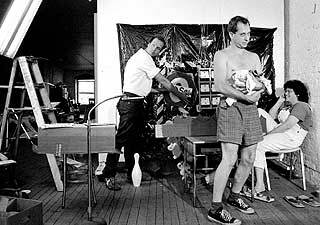 After the installation at the Center in 1972 of a second system, the Center began a Residency Program. Artists such as Paik, Shigeko Kubota, poet Jackson MacLow and glass artist and video activist Rudi Stern began to use the facility. An annual exhibition series brought video artists to the Southern Tier to present and discuss their work. Woody and Steina Vasulka, Beryl Korot, Gary Hill, Nam June Paik, Richard Landry and many other artists personally presented work through the Center’s program. The image processing system was further expanded in 1974 with the addition of the first Jones Colorizer and in 1975 with a set of keyers, a multi-input syncable sequencer and a bank of oscillators, all designed and constructed by David Jones. In 1975 the Center proposed the use of a computer as a digital image generating and control system for analog video imaging modules. This project was under the direction of Jones, Walter Wright and Dr. Don McArthur, in collaboration with Steina and Woody Vasulka and Jeffrey Schier. An outgrowth of this project was a research initiative placing primary emphasis on artist-oriented software and tools which interfaced with commercially available computers, principally the Amiga computer. Innovations included a 32 page frame buffer and control software and 2-D print software, designed by Jones. The Amiga system was further expanded with the additions of an audio keyboard and control software and a Toaster. Today the emphasis is on the integration of older analog with the new digital technologies to provide a richer and more complex interactive environment. The Residency program supports projects which approach video as a contemporary electronic cinema art practice. It has provided over 1500 artists the opportunity to study, through individualized instruction, the techniques of analog and digital image processing and to then use the system in the creation of new works. The Center provides a retreat-like environment where artists are encouraged to explore and to take risks. Each year approximately 40 artists participate. Over the years such artists as Amoeba Technology, Phyllis Baldino, Irit Batsry, Peer Bode, Torsten Burns, Peter D'Agostino, Vanalyne Green, Barbara Hammer, Kathy High, Gary Hill, Taka Iimura, Shaun Irons and Lauren Petty, Kristin Lucas, Christina McPhee, Marianne Petit, Alan Powell and Connie Coleman, Joanna Raczynska, Lynne Sachs, Simon Tarr, Termite TV, Jud Yalkut and many others have worked in residence, producing tapes which have been screened around the world. Each year, thousands of people have opportunity to view works created by artists participating in the Residency Program through museum and gallery exhibitions throughout the United States and internationally, through cable, broadcast and on the Web. The works have been featured at the Whitney Museum of American Art Biennial and the Museum of Modern Art. They are also frequently showcased by such presenting organizations as Hallwalls, the Kitchen, Anthology Film Archives, Harvestworks, Eyebeam and many others. They are often selected for inclusion in national festivals and invitationals such as the Black Maria Festival, the NY Video Festival, Viper, MIX and the many international festivals. Work has been included in national and regional cable and PBS series such as Reel New York, OffLine and No TV. Important early work has been included in Video Data Bank’s Surveying the First Decade: A History of Video Art and Alternative Media. The work is distributed by Electronic Arts Intermix, Women Make Movies, Video Data Bank and represented in many institutional collections. The Center provides administrative services to artists seeking support for projects. Participating artists have included Irit Batsry, Alan Berliner, Abigail Child, Leah Giliam, Ariana Gerstein and Monty McCollum, Jacqueline Goss, Slawomir Grunberg, Alex Hahn, Barbara Hammer, Gary Hill, Amy Jenkins, Ken Jacobs, Philip Mallory Jones, LoVid, Kristin Lucas, Dan Reeves and Igor Vamos. The Center also consults with arts institutions about establishing video programs and provides curatorial assistance with the public presentation of image processed works. Since 1989 we have awarded over one million dollars to organizations and artists in New York State. Presentation Funds provides support to NYS organizations for in-person appearances by film and media artists. The program brings innovative cinema programming, including independent film and new media, as well as sonic art to new audiences and to underserved communities in all regions of the State. Applications are accepted at any time. Finishing Funds provides completion awards to New York State's artists for diverse and innovative projects in film, audio and video, and works for the Web and new media. The deadline is March 15th each year. The Media Arts Technical Assistance Fund is designed to help non-profit media arts programs in the State stabilize, strengthen or restructure their organizational capacity, and address systemic issues within institutions and within the field. Through direct assistance the program supports organizational development and the building of critical skills to insure the vitality and longevity of the field. The Fund provides funding to help with the hiring of consultants or other professionals, staff attendance at professional conferences and meetings, and networking opportunities around the State. The Center's programs are supported by the Electronic Media and Film Program at the New York State Council on the Arts; Daniel Langlois Foundation for Art, Science, and Technology; the Media Arts Program of the National Endowment for the Arts; mediaThe foundation; The National Television and Video Preservation Foundation; NYS Challenge Grant Program; The Andy Warhol Foundation for the Visual Arts; the New York Foundation for the Arts; the Media Action Grant Program of Media Alliance; the Institute for Electronic Arts at Alfred University; Everson Museum of Art; IMAP; BAVC; VidiPax; and by corporate support from Dave Jones Design and Black Hammer Productions and by the contributions of many individual artists.